There are approximately 300 wolverines remaining in the Lower 48. More than half of the population exists in Montana, with smaller populations in Wyoming, Idaho and Washington. There has been a confirmed sighting(s) of the species in Oregon, California and Colorado. Research suggests that the biggest population of wolverines is in Glacier National Park (Montana), with the second biggest population (no one knows exactly how many) occurring in the Clearwater Basin. Wolverines are some of the slowest reproducing animals in the world. Females are often seven years old before they successfully breed. The best available science suggests that there only 35 wolverines in the continental United States that can reproduce. Extremely lower numbers in any limited population leads inexorably to an increased threat of inbreeding. Once inbreeding hits a small population, you can’t recover populations of a species. Wolverines face extinction from fragmented habitat and habitat loss due to climate change. The species depends on long-lasting snow pack for habitat, denning and raising their young. 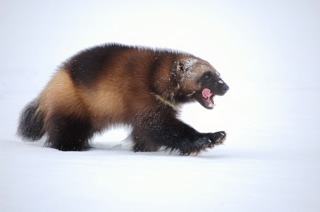 Mild and shorter winters, coupled with early springs, forces wolverines to move denning sites, increasing stress and the likelihood of predation on kits (young). Extensive trapping and poisoning efforts of past centuries has largely ended, though until recently, recreational trapping of wolverines was legal in Montana. Winter recreation, specifically snowmobiling and ski resorts, continues to threaten available habitat. Road building and logging also fragments landscapes, and cuts-off important corridors. Incidental trapping of the species remains a concern. The native wolverine is incredibly agile, a symbol of wilderness, you might say, due to its dependence on vast landscapes and undisturbed territories. During winter months wolverines may drop to lower elevations and valleys, following their prey. In the summer they generally occupy ridges and mountains, including alpine and sub-alpine landscapes. The US Fish & Wildlife Service announced in 2013 that the species warrants protection afforded under the Endangered Species Act. In 2014, the agency did an about face and chose not to list the species, triggering a lawsuit from conservation groups. If the US Fish & Wildlife Service is forced (by a court ruling) to list the wolverine under the Endangered Species Act, it is imperative that the agency also designate critical habitat for the species. Places like Pot Mountain and certain portions of the Weitas Creek Roadless Area in the Clearwater Basin would be a good place to start. Judge rules wolverine qualifies for listing under Endangered Species Act – April 2016. Learn more about the imperiled wolverine.